This is fantastic. And to a Jackie Robinson collector it is unusual. 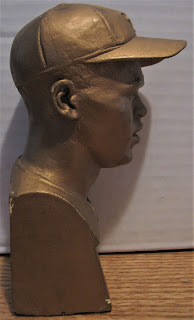 Featured above and below is a Jackie Robinson bust currently for sale at Inside the Park Collectibles (Auction Link). 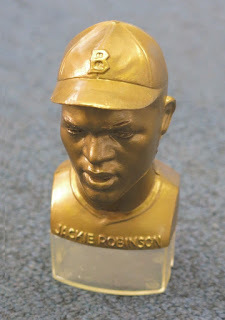 Likely from the 1940's, it exactly resembles a well known memorabilia piece commonly known to Robinson collectors as the Petitto Studios Jackie Robinson candy container. You can see a pic of that on the right. The bust stands about 5 1/2" tall (roughly twice the size of the candy container without the clear plastic) and also includes a Petitto Studios makers mark on the reverse. So, they both come from the same place, and it makes me wonder if the bust was a model for the ensuing candy box. I say this because the candy container is quite plentiful (as vintage memorabilia goes); whereas, this bust is something I have never seen before. According to the auction house this is a first for them too. I have no idea what something would be worth, but I am sure it'll find it's way into someone's collection. It's just too unique to be ignored. UPDATE: I see now that this exact bust recently sold on eBay (link here) at $158.05. So the buyer is trying to flip it. 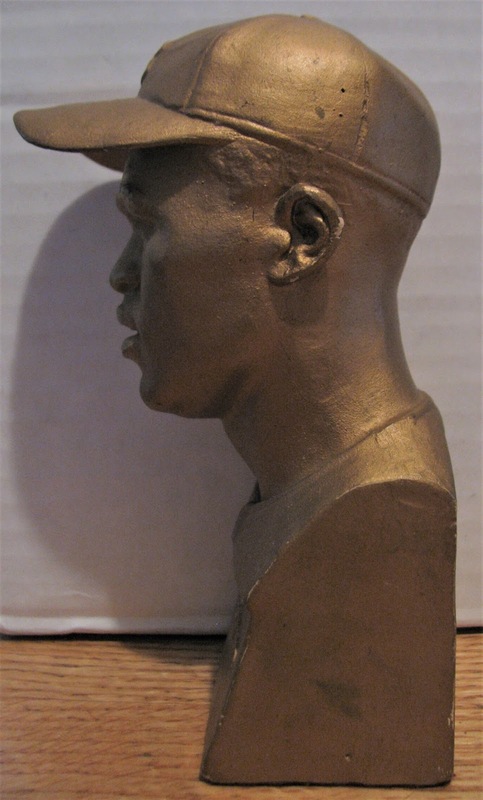 One thing that auction notes is that the bust is made of plaster.